Tiger Den is a best wildlife Resort in Ranthambore National Park which is nestled in the lap of nature provide an inspiring location with wildlife travel experience. Tiger Den Resort is situated outside edge of Ranthambhore National Park, surrounding by fascinated grand Aravali Hills which come alive as a hedge of green and provides great tranquility to the mind of tourist. Due to closest to the National Park therefore you can get a feeling of staying in the wild. Tiger Den Resort is inspired by nature and its fascinating loveliness is relaxing haven of guests. 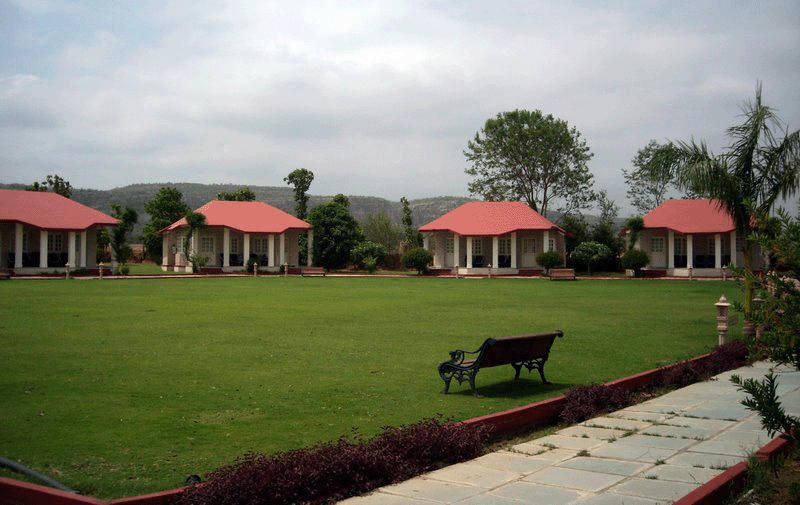 The hotel has a sprawling green lawn area with flowers buds and roses garden. A central restaurant with a wide veranda adjoining the lush green garden offers enchanting view. The Hotel is furnished with the essential modern facilities with the guarantee of your pleasant stay. Overall it is a best wildlife place to stay away from noisy environment of the city life. Tiger Den Resort is known as of quality services and luxury accommodation. There are 38 air conditioned deluxe cottage/rooms and 12 luxuries suite cottages/rooms. Each room interiors have decorated with splendid designs, unique color scheme and outfitted with modern amenities. In case of electricity failure there is standby power backup generating unit. The resort has a centralized beautiful dining hall with a wide veranda that offers delicious flavors of western, Indian and Chinese cuisine. The resort provides barbeque dinners where guests get pleasure from the live local cultural activities and bonfires give them warmth with hygienic service.